As with just about everything, knitted items are even cuter in tiny sizes. Sure, I can knit a hat, but shrink it down to baby size? Instantly adorable. So of course I love to have a reason to knit a baby hat, and when CC announced her pregnancy several months ago, my brain went into overdrive while trying to decide what to knit for her. 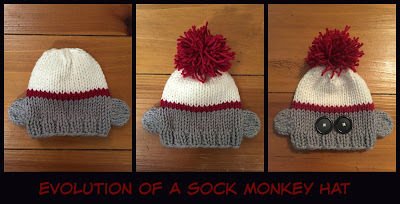 I ended up going with a sock monkey-inspired hat, because she likes sock monkeys, and for good measure, I decided to knit a tiny cardigan - after all, a winter baby needs to be warm! I had the patterns all picked out before I went to California, with the intention of shopping for the yarn while I was there - I wanted to be able to see it in person and make sure it was soft enough for a new baby's skin. Debby and I went to Monarch Knitting in Pacific Grove, and I squeezed many skeins of yarn before choosing everything for the hat and cardigan. I knew I wanted a blue for the sweater, as CC had mentioned she loved blue (but not a pastel blue), and Debby ended up finding the perfect color...we bought the last three skeins of it, and while I was pretty confident I could knit the sweater with only one skein, she promised to send me some extra yarn if I ran out. Luckily, I didn't need that, mostly because I knitted the 0 - 3 month size. Blue yarn is Madelinetosh Sport in Artic colorway, red yarn is Madelinetosh Pashmina in Tart colorway (I had this in my stash already). Pattern is Noah Baby Cardigan. I learned a lot by knitting this cardigan - it was knit in pieces and seamed together, so that was a new experience for me. I usually weave in my ends as I knit, but life would have been easier had I not done that with this sweater, as it made seaming a bit more challenging. Rookie mistake - didn't hurt the sweater; just made me work harder when I seamed it together. I also learned how to do a crocheted edge - I really wanted the deep red edging to make the sweater pop (and I loved how it looked with the deep red buttons), and while the designer recommended doing a knitted edge, I couldn't make that work, so I watched a couple of You Tube tutorials on crocheting an edge, and got the hang of it pretty quickly. I loved the v-neck of the sweater for a baby boy, and while I didn't plan on having it match the sock monkey hat, I think it goes together really well. After I sewed on the button eyes, I decided they were a little too close together, so I removed them and spaced them out a little bit more. Yarn is Ewe Ewe Yarns Wooly Worsted in Brushed Silver, Red Poppy, and Vanilla colorways; pattern is Knitted Sock Monkey Hat. I'm surprised I'm still alive, because this hat killed.me.dead. with its cuteness. Have you ever made something and been so amazed at how well it turned out? Well, this was like that for me. I just love this hat so much! Knitting for babies is so fun. It goes fairly fast just because the items are so small, but boy howdy do they pack a big punch in cuteness. 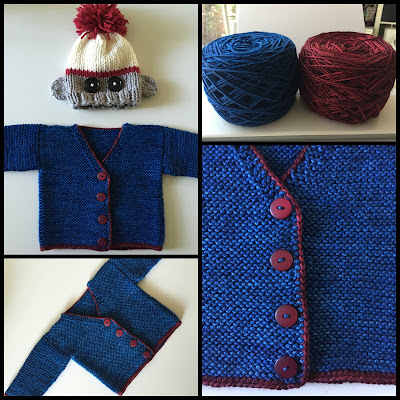 I really enjoyed knitting these items, and I can't wait to see baby Mason wearing them soon! Have a great weekend - we have 10 miles on tap for tomorrow! The monkey sock hat is so cute! Along with the sweater so adorable. Knitting baby things can become addictive they are so cute and knit up fast. Good luck on your ten miles. I hope you guys are having some cooler weather to run in this weekend. We are supposed to be getting our first big cold snap late this weekend down into the 40's but we will have to wait and see if it really happens. I am waiting for our expected cold front to come in today, and all I keep thinking is "please don't stall" - I am really hoping to run in the 40s tomorrow! Awww both are so cute! Don't forget to show us a photo when baby Mason is wearing it. OMG SO cute! I saw a lady that makes these knitted Boleros and then puts like a jewel in the middle. I thought of you when I saw them and though "Shelly could do that". They were So pretty! Those are FANTASTIC!!! Now I wish I knew someone having a baby so I could hire you. 10 miles - whew! I still haven't run 10 miles again since my race at the beginning of October. Hope the humidity levels cooperate. I haven't run 10 miles since January, so this is gonna be interesting. Love, Love this set!! The deep red really makes the cardigan pop. Great job!! Wow, so cute!! You are becoming a knitting pro! Good luck on your 10 miler - hope the weather cooperates! Just amazing. I really love the red edge on the sweater. Oh, and I think I have a yard and a half of the blue leftover that I could send to you :) You used some very nice yarn for a baby sweater--they do know to NOT throw it in the washing machine, right?? The hat--how did you do those ears? They came out so perfect! Well I guess it's a good thing I didn't go up a size in the sweater, LOL! Sounds like we both got all the use we could from that gorgeous blue yarn. And the ears were part of the pattern - I remember it feeling strange as I was knitting them, but I just followed the steps and boom - monkey ears! I am in LOVE with the sock monkey hat!!!! Does the pattern size up to adult sizes??? Or at least Paco sized? Thank you - I love these so much, too! I am surprised the cuteness of these projects didn't kill you too! They both turned out fabulously! Interesting about NOT weaving in as you go - who would think that would ever be a BAD thing? !